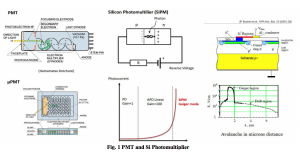 The pixel array silicon photomultiplier (SiPM) is known as an excellent photon sensor with picoseconds avalanche process with the capacity for millions amplification of photoelectrons. In addition, a higher quantum efficiency(QE), small size, low bias voltage, light durability are attractive features for biological applications. The primary disadvantage is the limited dynamic range due to the 50ns recharge process and a high dark count which is an additional hurdle. We have developed a wide dynamic Si photon detection system applying ultra-fast differentiation signal processing, temperature control by thermoelectric device and Giga photon counter with 9 decimal digits dynamic range. The tested performance is six orders of magnitude with 600ps pulse width and sub-fW sensitivity. Combined with 405nm laser illumination and motored monochromator, Laser Induced Fluorescence Photon Spectrometry (LIPS) has been developed with a scan range from 200~900nm at maximum of 500nm/sec and 1nm FWHM. Based on the Planck equation E=hν, this photon counting spectrum provides a fundamental advance in spectral analysis by digital processing. Advantages include its ultimate sensitivity, theoretical linearity, as well as quantitative and logarithmic analysis without use of arbitrary units. Laser excitation is also useful for evaluation of photobleaching or oxidation in materials by higher energy illumination. Traditional typical photocurrent detection limit is about 1pW which includes millions of photons, however using our system it is possible to evaluate the photon spectrum and determine background noise and auto fluorescence(AFL) in optics in any cytometry or imaging system component. In addition, the photon-stream digital signal opens up a new approach for picosecond time-domain analysis. Photon spectroscopy is a powerful method for analysis of fluorescence and optical properties in biology.